Location(s): Tustin, Ca – Sender One Climbing Gym – within 10 minutes of John Wayne Airport, Irvine, and the Anaheim Convention Center. We’re within 25-35 minutes of Laguna Beach, Huntington Beach, and Newport Beach. New LAX location also available. Investment: Starts at $3750, dependent on group size. Ideal for groups of 12 or more people. Inquire below for a custom quote! You have NEVER seen a team building event like this one!!! 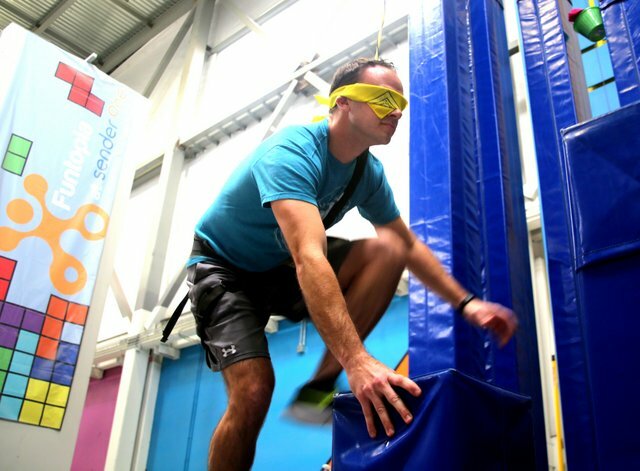 Bring your team out for an amazing corporate team building event where you’ll be climbing, falling, building, and jumping around our crazy fun indoor obstacle course! It’s not parkour or free running but it’s a LOT of fun. Located in the heart of Orange County we’ve taken elements of the TV shows Wipeout and American Ninja Warrior and created Wipeout Warrior. You and your team will have access to all of our challenges for the Practice Phase. You’ll need to figure out who will represent your team on each one during the Game Phase. After the practice session it’s GAME ON!!! Your team will rotate through each challenge station and try and outscore the other teams. But watch out…. we’ve come up with some hilarious twists that keep your team thinking, reaching, and laughing all the way to the winners podium! Physical components add a memorable hook to this event. Teams will need to communicate and trust each other if they want the win. Onsite Coordinator, Event Staff, Safety Team, Team Bandanas, PA System (if allowed), Set-up/Teardown, Photos of the Day, Group Photo, Facility Rental, Safety Equipment, Team Challenge Equipment, Additional Climbing time available on request.